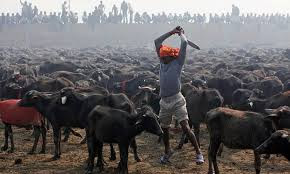 The world's biggest animal sacrifice event, held every five years for for around 265 years at the Gadhimai Festival in Nepal; has been cancelled indefinitely by the Gadhimai Temple Trust. This welcome move will spare the lives of millions of innocent animals over coming years. With the Supreme Court of India’s intervention to prohibit the movement of animals from India to Nepal, there was a reduction of up to 70 percent in the number of animals sacrificed from 2009. The Supreme Court’s order resulted in more than 100 arrests of those breaching the order, and more than 2,500 animals saved. Earlier this month the Supreme Court of India issued directions to states to set up mechanisms to prevent animals from being taken to Gadhimai in future and create awareness against animal sacrifice. The origins of Gadhimai date back around 265 years ago, when the founder of the Gadhimai Temple, Bhagwan Chowdhary, had a dream that the goddess Gadhimai wanted blood in return for freeing him from prison, protecting him from evil and promising prosperity and power. The goddess asked for a human sacrifice, but Chowdhary successfully offered an animal instead, and this been repeated every five years since. It is estimated that more than 500,000 buffalo, goats, chickens and other animals were decapitated at Gadhimai in 2009, but in 2014 the numbers had reduced by 70 percent. There were rigorous negotiations and campaigning by Animal Welfare Network Nepal, Humane Society International-India, People for Animals-India and thousands of independent voices against this massacre of animals at Gadhimai. And it all resulted in a tremendous victory for compassion that will save millions of animals now. We can't thank enough all the people and organizations that made this victory possible.